For those homeowners who have waited out the lull in San Francisco Bay Area Housing market, your patience is now being rewarded! Rates are expected to seesaw in coming weeks as the market enters a volatile period. The continued low interest rates are a big reason for the all out Seller’s market that we are now seeing throughout the Bay Area! It’s as if every buyer that was sitting on the fence has suddenly come off the fence this year and there isn’t nearly enough inventory available for the greatly expanded pool of qualified/interested buyers. Inventory has been shrinking consistently for the last 10 months. Since May/2011, the residential (Class 1 and 2) property inventory for the Peninsula has dropped from 1,357 units to currently just 607 units. For the Upper South Bay/Lower Peninsula hub, over the same period, inventory has dropped from 863 units to 317 units currently. For the San Jose area over the same period, inventory has dropped from 2,405 units to 988 units currently. These are staggering figures. The combination of extremely low inventory and a hugely expanded new pool of buyers has created a Seller’s market frenzy similar to what we saw in the years 2005 and 2000! Another major reason for the sudden rush of Bay Area buyers is last year’s spike in Bay Area rental prices. 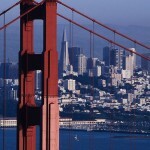 For 2011,San FranciscoandSan Josesaw average rental rate increases of 5.9% and 4.9% respectively. Such increases are one reason why industry analysts believe 2012 will be the first year since 2005 when the share of apartment renters that moves out to buy a house increases from the previous year. Historically, the cost to rent an apartment has been about 10% lower than the after-tax cost of owning a home. That rental discount began to fall in 2010 and disappeared entirely last year, according to analysts at Deutsche Bank who track housing costs. By the end of 2011, the bank’s research found that the cost to rent an apartment was about 15% “higher” than the cost to own a home. Combine “this” factor with historically low interest rates and renewed consumer confidence and you have an explosive situation with way more buyers than available inventory. The only thing that will limit the impending spike in Bay Area real estate values will be the appraisals obtained for financed purchases. Most buyers now “have” to pay more than the appraisable value of the home they are bidding on in order to have any chance to win the bid. In some cases, a low appraisal will give the buyer a chance to negotiate the price down before actually completing the purchase. However, in most of the multiple offer situations going on right now, the Seller is able to get at least 1 (usually “more” than 1) of the bidding buyers to waive their appraisal contingency. That eliminates the possibility of negotiating the price down if the appraisal comes in low. Also, cash buyers don’t typically have appraisal contingencies and there are plenty of cash buyers right now in the 750K and under market. For those home owners who have waited out the lull in the Bay Area Housing market, your patience is now being rewarded. We are now seeing a Seller’s market the likes of which we haven’t seen since 2005. This should be the beginning of a major move back up in Bay Area home values. Those who are in the market to buy now will need to understand that it’s highly competitive right now since there’s much more demand than supply. Serious buyers will need to be ready to look at properties within a day or 2 of coming on the market and (in order to be able to win the competition for the given property) must be willing to go much higher in their bids than what the comps say the property is worth. 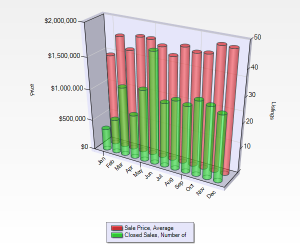 Until the inventory goes back up significantly and/or interest rates go up significantly, this frenzied Seller’s market should continue and home prices will see a major spike up throughout this 2012 Buying season. Mortgage rates continue to skirt all-time lows. The 30-year fixed mortgage rate averaged 3.87% for the end of this past week, down from 5% the previous year. That is the lowest in Freddie Mac’s survey data, which stretches back to 1971. For primary residence purchases, the Avg 30-Yr fixed Conforming loan w/0 Pts is at 3.75% and the Avg 30-Yr fixed High Balance Conforming loan w/0 Pts is at 4%. It’s clear that the “Average” home sale price has edged lower in some areas recently, but that’s merely a reflection of the fact that the low-mid price segment of properties are the hot sellers, not of any deterioration of individual property values. January’s San Francisco Bay Area median of just $326,000 is a reflection of how skewed the market has become toward distressed, lower-cost properties. The 800K and under market is hot right now as investors gobble up the low end (400K and under) REO’s and Short Sales and regular home buyers in the 500-800K mid-range are taking advantage of low interest rates, lower home prices, and a renewed perception of economic and job stability. The higher-end (1M+) sales have slowed in recent months as many struggle to qualify for Jumbo loans and others just sit tight. Meanwhile, we’ll be watching to see how housing prices might be impacted by the government’s recently announced efforts to help homeowners refinance, or otherwise avoid foreclosure. The federal-state settlement with 5 major banks reportedly calls for billions to be spent in California to help certain underwater homeowners reduce their principal (through the HARP 2 refinance loan program) and avoid short sale or foreclosure. What’s not clear is the extent to which these efforts will kick in during the first half of 2012, which could alter the course of some who are on the brink of foreclosure right now. 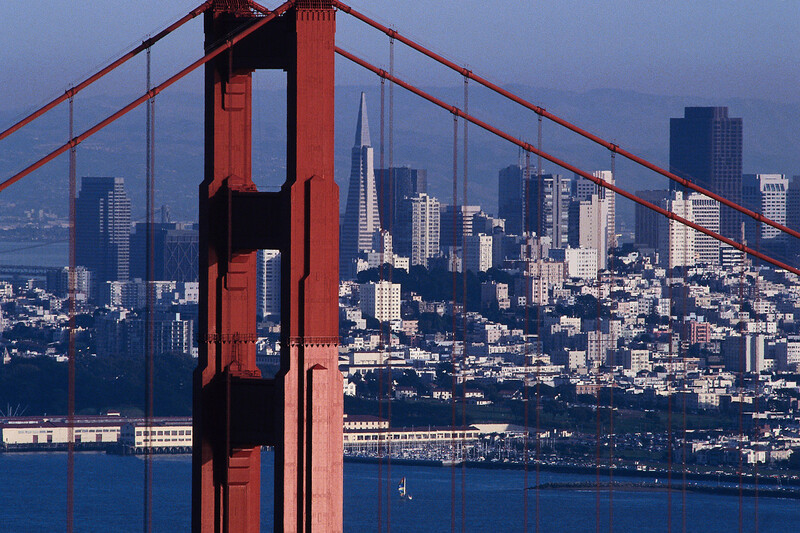 If the most recent San Francisco Bay Area inventory and buying activity trends are any indication, we are in for a better than expected 2012 for San Francisco Bay Area Home value recovery. Whether you’re currently in the process of buying a home or thinking about it for the future, this will be a very major commitment in your life and there are some key things to consider before making that purchase. Am I likely to want to own it long term? The most important thing to ask yourself before buying any property is whether you are likely to own it for a long time, such as 5 years or more. People buy property in hopes of increasing wealth and five years is about the break-even point for earning appreciation in value above the buying and selling transaction costs. Considering the uncertainty of the short term direction of homes values, if you don’t plan on holding the property for “at least” 3 years and you aren’t purchasing it to become a rental property, it probably isn’t worth considering. Buying and selling a home quickly will often leave you worse off financially than if you just held off on becoming a homeowner and rented instead. Do I truly love the home I want to buy? It’s extremely important to consider whether you truly love the property you’re considering. Real Estate should typically be held for the long term and your enjoyment of a property should perpetuate a happy and enduring ownership period. So don’t buy a property on impulse. Make sure that you truly do love it. Don’t buy a home just for the “sake” of “buying” because you’re envious of others who own a home or others who tell you it’s a good idea. Buy what you want and after careful consideration, when you are truly ready, buy a home that you will feel proud to own for many years to come. The cost of owning/maintaining a home is typically more than anyone anticipates going into it. You should to make sure that you’re comfortable with the mortgage payments, even if your lender tells you that you qualify for the given loan and purchase price. Lenders don’t take into account many day-today expenses like health care, child care, expensive lifestyles and habits, etc. Make sure that you can comfortably afford your home payments, still pay your other bills and expenses, and also still have a little left to save for retirement. Also, if you’re unsure of your long term employment situation for any reason, wait until your job situation is stable. Is the home in good condition? Be aware that fixer homes often don’t sell at enough of a discount to compensate for all the work that needs to be done. The cost of good quality construction and rehabilitation work can be astronomical and unless you are yourself a contractor, it typically will cost much more than you anticipate. You might want to leave the “needs TLC” or “fixer-uppers” property listings for the contractors out there and instead buy something in at least “Average” and “Livable” condition in order to avoid getting swept up in a disastrous rehab project. How much do you know about the neighborhood? Make sure that you do adequate research, look at enough properties, get a feel for the neighborhoods, and learn about property ownership with your Realtor before you made an offer. If you recently moved into town or don’t know the particular area, it might be a good idea to rent for a while and seek out the community that would be the most perfect for you within your financial means. This will be the biggest investment you ever make. You need to educate yourself in order to minimize the risk of the investment going wrong. While there‘s no such thing as “risk-free” real estate, it would be wise to consider the questions above. Careful consideration of these key questions will increase your chances of experiencing a joyous, long-term property ownership experience. Due largely to the lagging economy and the Euro crisis, Mortgage Rates remain at record lows to begin the year with the Avg 30-Yr fixed mortgage being at 4.18%, a # that is right between the low of 4.13% we saw at the beginning of October and the 4.23% Avg we saw throughout most of November and December. The Fed says it will keep the key federal funds rate near zero until mid-2013 and continues to reinvest in long-term securities to help keep rates low. However, a recent move by Congress will surprise some borrowers with higher mortgage fees in the coming weeks. On April 1st, the guarantee fee on loans that can be sold to Fannie Mae and Freddie Mac is set to increase by a minimum of 10 basis points and lenders have already started to pass that extra cost on to borrowers. Some lenders have plans to increase the price of their loans anywhere from 20 to 80 basis point, which translates to .125% – .25% in interest. 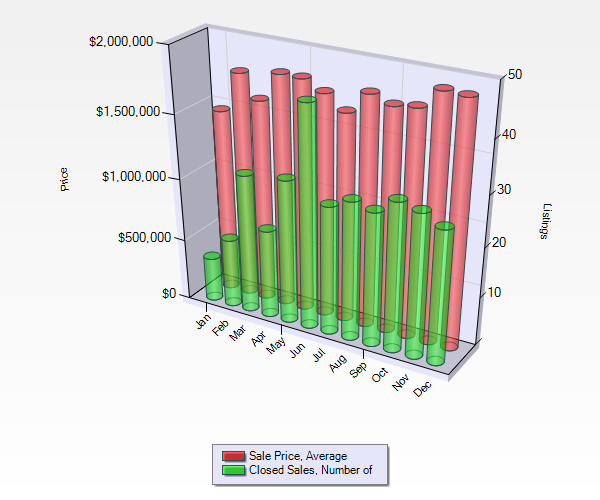 Turning to the latest Real Estate trends, we finished up 2011 with another month of sales outpacing listings and inventory going down (for the 7th straight month) throughout most of the SF Bay Area. Overall, there was a net drop of ~40% of residential property inventory year-over-year from Dec 2010 to Dec 2011. Despite the trending of inventory reduction, SF Bay Area property values were flat through 2011 and we haven’t seen any appreciable gains in value since we hit the bottom of our current real estate cycle in the Winter of 2009. The median price paid for all new and resale houses and condos sold in the SF Bay Area in November was $363,500. That was up 3.9% from $350,000 in October, but down 4.3% from $380,000 in November 2010. The median has declined on a year-over-year basis for the last 14 months. The low point of the current real estate cycle was $290,000 in March 2009. The peak was $665,000 in June/July 2007. 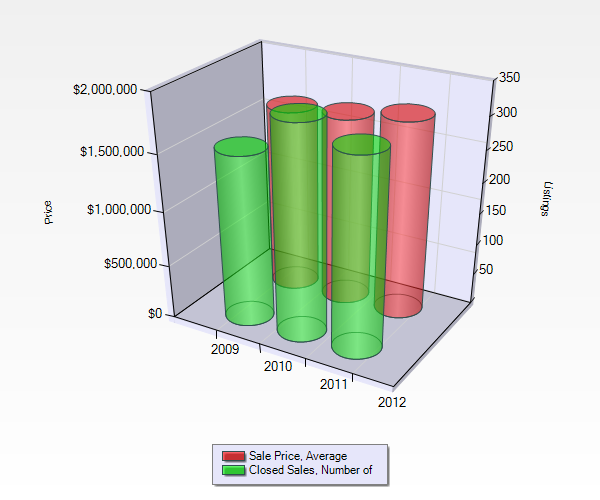 The median price of a SF Bay Area Single Family home was down 8.5% from Nov 2010 to Nov 2011 (from $511,140 to $467,680). San Mateo & Napa were the only SF Bay Area counties with a year-over-year “gain” for November (5.6% gain for San Mateo, 1.4% for Napa). Just as in 2011, many will be trying to figure out where housing is headed for 2012. While the housing market didn’t worsen in 2011, it didn’t stabilize either. This year, the story will be about local markets. While many housing markets rose and fell together, they’re recovering at difference paces. The key factors to effect the pace of recovery will be Confidence and Jobs, the Rental market, Mortgage Credit and Rates, and Foreclosures. Housing is more affordable than it has been in decades and most SF Bay Area residents believe that this is a good time to buy, but some would-be buyers are worried about the short term direction of home values, some are worried about their job stability, and still others can’t qualify for a mortgage because of damaged credit and/or today’s tighter mortgage standards. However, if low mortgage rates aren’t enough to give urgency to would-be buyers, recent rent hikes could accelerate buyers’ decisions to take the plunge. I believe the greatest degree of home value recovery will come out of significant reductions in distress sales. SF Bay Area foreclosure reslaes peaked at 52% in Feb 2009. In recent months, foreclosure resales have been accounting for ~25% of resales. 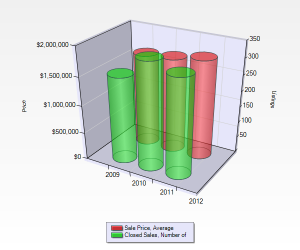 However, short sales are as popular as ever, still accounting for ~21% of all resales, up from ~16% 2 years ago. Also, banks and other mortgage investors own around 440,000 foreclosed properties nationwide, but there’s another estimated 3.4 million loans in foreclosure or serious delinquency. In the mean time, we enter 2012 on a positive note for the SF Bay Area housing market with low mortgage interest rates, a high level of housing affordability, and inventory trending down. February is typically the start of the biggest selling season here & we will know by April whether there are enough buyers lined up to keep pace with the many homes coming on the market in the new year.